Master Hand Violin Shop is committed to helping you find the best instrument for you, whether it is from our store or another store. We are have a no-pressure policy and encourage you to take your time identifying the best instrument for you. We refuse to accept and participate in kickbacks with outside persons. We are committed to excellence in preparing instruments and believe our instruments speak for themselves. 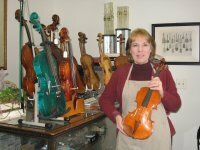 Elizabeth Ecklund has worked and excelled in violin repairs and sales for over 40 years. Already a standout violinist, Betty's career in repairwork began in high school with an apprenticeship that she came across while looking for a summer job. Betty asked Gerald Brobst, world-renowned owner of Brobst Violin Shop, for a job. He jokingly said that he did not need a new clerk, but rather, he could use a new apprentice. Betty took him up! After apprenticing through high school, Betty left home for college at Michigan State University, where she joined the MSU orchestra. After her first year of college, there was a call for her to work part-time in instrument repairs at Michigan State. Betty agreed to help with the needs of the MSU orchestra, and thus began her first shop. Upon graduating college, Betty moved to Wheaton, IL with her husband, Larry Ecklund. After three months of relaxing, Betty was ready to again open up a shop. She opened in the Wheaton College Conservatory in an expanded instrument repair specialist and Luthier capacity to the one she served in college; Master Hand Violin Shop was born! After working at Wheaton College for a few years, Betty found that the space was too limited for the amount of business she was receiving and the amount of inventory that she needed. Master Hand Violin Shop has relocated four times in the past 40 years to accommodate the ever growing demand for Betty's work. Master Hand is currently located on 546 S Main St in Broadway, VA, and is hoping to never leave its current home. Betty has continued to be at the store at all times and guarantees all work. However, due to all the growth, two of her three daughters are frequently at the shop to help. And rumor has it that the third generation of Master Hand is finally here.